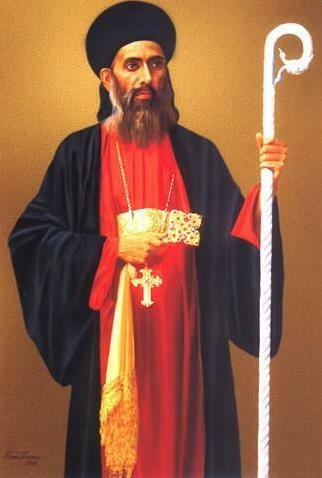 St. Geevarghese Mar (or Mor) Gregorios (Chathuruthil) (1848-1902), popularly known as Parumala Thirumeni (Bishop of Parumala) or Kochu Thirumeni, was a bishop of the Malankara Orthodox Syrian Church. He was a Patron of the Order of the Crown of Thorns and received that Order from Prince-Abbot Joseph III in a ceremony in Columbo on 30 May 1892. Geevarghese was born into the Chathuruthy family in Mulanthuruthy, Kerala. His parents, Kochu Mathai and Mariam, had three sons and two daughters. After the birth of the fifth child, Ipeora, Mariam died. Geevarghese was educated by Malpan (teacher) Geevarghese of Chathuruthy, Kochi, and was ordained as a deacon on 14 September 1858 at the age of ten by Palakkunnathu Mar Athanasius and was reordained in 1864 at Karingachira St. George Jacobite Church. He was ordained priest by Mar Koorilose Yuyakim in 1861. He was ordained chorepiscopus on 17 November 1865. On 16 December 1876 he was consecrated by Moran Mar Ignatius XXXIV Peter III/IV, Patriarch of The Syrian Patriarchate of Antioch and All the East. Between 1876 and 1902 he was Metropolitan of Niranam and Thumpamou in The Malankara Orthodox Syrian Church. Mor Gregorios served as Secretary and translator of H.H. Patriarch Ignatius Peter IV and witnessed the historic Mulanthuruthy Synod resolution of 1876 signed between Syrian Orthodox Church in India and Holy throne of Antioch and All the East. Mor Gregorios was appointed the bishop of Niranam, Kerala. He started a monastery at Parumala, Kerala. Parumala Thirumeni did not let all the responsibilities of teaching, administration, and scholarly pursuits distract him from his true calling, to serve fellow human beings. When a smallpox epidemic (a near fatal disease at the time) struck Thumpamon and surrounding areas, Thirumeni personally visited every home that had been affected, over protests from many loved ones, to pray for and comfort the sick regardless of their caste or creed. His faith and his actions garnered him a lot of support not only from within the Malankara Church but the entire Indian community. St. Gregorios became sick when he returned from Veeyapuram Church after blessing a marriage. Even from the beginning of his illness he knew that he was in his last days. He died on 2 November 1902 at midnight aged 54. He was later proclaimed as a saint first by the Indian Orthodox Church and later by the Catholicos of the East of the Syrian Orthodox Church (Jacobite Syrian Orthodox Church). His tomb and birth place are also centres of pilgrimage.